The U.N. General Assembly voted overwhelmingly Tuesday to urge the United States to end its 46-year-old trade embargo against Cuba after its foreign minister accused the U.S. of stepping up its "brutal economic war" to new heights and vowed to "never surrender." "The blockade had never been enforced with such viciousness as over the last year," Felipe Perez Roque told the assembly, accusing U.S. President George W. Bush's administration of adopting "new measures bordering on madness and fanaticism" that have not only hurt Cuba but interfered with its relations with at least 30 countries. It was the 16th straight year that the 192-member world body approved a resolution calling for the U.S. economic and commercial embargo against Cuba to be repealed "as soon as possible." Delegates in the 192-member General Assembly chamber burst into applause when the vote in favor of the resolution flashed on the screen - 184 to 4 with 1 abstention. That was a one-vote improvement over last year's vote of 183 to 4 with 1 abstention. In addition to the U.S., Israel, Palau and the Marshall Islands voted against the resolution while Micronesia abstained. Albania, El Salvador and Iraq did not vote. The annual vote came less than a week after Bush delivered his first major address on Cuban policy in four years, attacking Cuba's government and challenging the international community to help the people of the communist island shed Fidel Castro's rule and become a free society. Perez Roque called the vote the international community's answer to Bush's speech. "I think it is an historic victory. 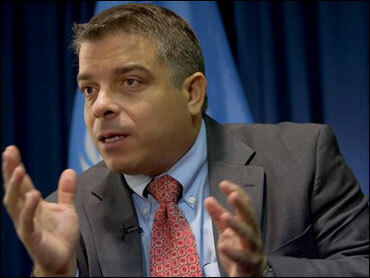 It is an Olympic record in the General Assembly," the Cuban foreign minister said in an Associated Press interview. "Today, the international community have expressed their support to the Cuban right to be an independent nation, to be respected in its right to self-determination." Even though the resolution is not legally binding, Perez Roque said the vote "has a very important ethical and moral meaning" because it supported the Cuban struggle against the embargo and strengthened "our resilience and our decision, really, to resist and finally to defeat the blockade." In Havana, state television gleefully lead with news of "a resounding victory for Cuba" and said the island had received "the resounding support of the international community." Celebratory music blared and a waving Cuban flag was shown over the words "Viva Cuba Libre!" or "Long Live Cuba!" The United States has no diplomatic relations with Cuba, lists the country as a state sponsor of terror and has long sought to isolate it through travel restrictions and a trade embargo, which has been tightened over Bush's two terms. This year, the U.S. stepped up enforcement of financial sanctions, which Perez Roque strongly denounced. The Bush administration sees Castro's failing health as an opening for change. Little is different under Raul Castro, 76, and Bush said in his speech that the U.S. will make no accommodations with "a new tyranny." Speaking just before Tuesday's vote, U.S. diplomat Ronald Godard said "it is long past time that the Cuban people enjoy the blessings of economic and political freedom." "Instead of voting in favor of this resolution condemning the United States for declining to engage in unrestricted financial transactions with a regime that deprives its own people of the fundamental human rights that this body is charged with protecting, we urge member states to oppose and condemn the Cuban government's internal embargo on freedom, which is the real cause of the suffering of the Cuban people." Perez Roque, in his address, accused the United States of violating international law, depriving Cuban children of medication, punishing anyone doing business with Cuba, and even preventing Cuban writers from participating in a book fair in Puerto Rico, which he called "a barbaric act." He expressed Cuba's solidarity with U.S. movie producer Oliver Stone, who was attacked by the U.S. government for filming in Cuba, and activist director Michael Moore, who is being investigated for visiting Cuba. "It is McCarthyism of the 21st century," Perez Roque said, referring to the political witch hunt that U.S. Sen. Joseph McCarthy carried out against suspected American communists in the 1950s. "Without doubt, as you well know, the brutal economic war that has been imposed on Cuba hasn't only affected Cubans," he said, pointing to banks and companies in many countries that have been hurt by the U.S. financial measures. Perez Roque accused the U.S. of ignoring the 15 previous resolutions "with arrogance and political blindness," but he said despite the continuing harsh sanctions, Cuba would not be cowed. "Cuba will never surrender," he said. "It fights and will fight."